Kedarnath Temple, one of the holiest among the four Char Dham Temples in Uttarakhand, is situated amidst the scenic beauty of the Garhwal Himalayas, in Kedarnath, Uttarakhand. Located at 3583 m above sea level, near the Mandakini River, Kedarnath Temple is also one of the twelve Jyotirlingas shrines dedicated to Lord Shiva. Built in the 8th century by Jagat Guru Adi Shankaracharya, this famous Chardham pilgrimage site is situated next to a temple built by the Pandavas of Mahabharat. Kedarnath Temple opens for only 6 months in a year from the last week of April to the first week of November due to the heavy snowfall and harsh weather conditions. In 2012, Kedarnath Temple opening date is 28th April 2012 and the temple closes on 13th November 2012, after Diwali Festival in India. In Kedarnath Temple, Lord Shiva is worshipped in the form of a swayambhu Linga. The lingam is conical in shape which is an unusual feature. The statue of Nandi - the celestial bull, stands at the entrance of the temple. The interiors of Kedarnath temple are decorated with carved images from mythology. Inside the first hall are the statues of Lord Krishna, Pancha Pandavas, and Virabhadra (Veerabhadra), one of the greatest guards of Lord Shiv. Kedarnath Temple is said to be more than 1000 years old and is built of evenly cut gray slabs of stones. There is a Garbha Griha for worship and a Mandap for pilgrims and visitors. Kedarnath Temple lies close to the Indo-Chinese border and is bordered by snow covered peaks. 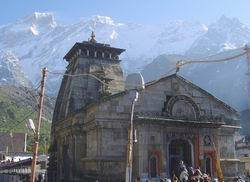 The Samadhi Mandir of Jagadguru Adi Shankara is situated behind the Kedarnath Temple. According to a legend, Pandavas wanted to redeem themselves for the sins of having killed their own brothers during the Mahabharata Kurukshetra War (war between the Pandavas and Kauravas). Lord Shiva avoided them repeatedly and took refuge at Kedarnath in the form of a bull. As he was followed by the Pandavas, he dived into the ground, leaving behind his hump on the surface. This conical projection is worshipped here as the idol. The remaining portions of Lord Shiva are worshipped at four places, namely, the arms (bahu) at Tungnath Temple, mouth (mukha) at Rudranath, naval (nabhi) at Madmaheshwar and hair (jata) at Kalpeshwar. Kedarnath and these four shrines are treated as Panch Kedar. The temple opens only 6 months a year (April - November) when the sun enters the zodiac sign of Aries and it is closed when the sun enters Scorpio. Then the idol is taken to Ukhimath, where the worship is continued during the winter season. Kedarnath is about 234 km from Rishikesh and 250 km from Dehradun. Nearest airport is Jolly Grant Airport at Dehradun. Nearest railheads are Rishikesh and Kotdwar (260 km). The motor-able road to Kedarnath Temple ends at Gaurikund and from there pilgrims have to trek 14 km to reach Kedarnath Shrine. Gaurikund is connected by road to Rishikesh, Kotdwar, Dehradun, Haridwar and other important hill stations of Garhwal and Kumaon region. Chorabari (Gandhi Sarovar) is a small lake situated about 2 km from Kedarnath. Vasuki Tal, another charming lake is about 6 km. Gaurikund (14 km) is the trekking base to Kedarnath and has a temple dedicated to Gauri. Sonprayag (20 km) is the confluence of Son Ganga and Mandakini rivers. Triyuginarayan (25 km) is a 5 km trek from Sonprayag. It is the mythological venue of the marriage of Lord Shiva and Goddess Parvati. Guptkashi (49 km) with temples of Ardhnarishwar and Vishwanath are noteworthy sites. Besides, Ukhimath (60 km), Agastyamuni (73 km), Chandrashila Peak (93 km), Deoria Tal (68 km) are also worth visiting.